Bring your canine companion dressed to impress celebrity judges! It's easy, and the costume options are limitless! Imagine your precious pooch dressed as a Civil War soldier, coal miner, David Crockett, moonshiner, or pioneer! Free registration begins at 9:30 a.m. Contest on the WDVX Radio and Clayton Country Music Stage begins at 10:15 a.m.
Join the East Tennessee Historical Society on Saturday, August 17, for an one-of-a-kind celebration of our region's history! Participants representing the people, places, and events that shaped our past spill out of the East Tennessee History Center and fill downtown Knoxville, making history truly come alive! Walk the East Tennessee Timeline, replete with re-enactors interpreting time periods from early settlement to the Vietnam War. Participate in hands-on activities that keep cherished crafts alive. Board a bus and tour Knoxville's historic homes. Sit a spell in front of the Main Stage, listening to traditional music that has long been the soundtrack to our lives. All for FREE! 10:00 and 11:00 -- Merikay Waldvogel is an internationally known quilt historian, author, and lecturer. In 1983 she was co-director in the two-year collaboration to document quilts across the state of Tennessee. She was inducted into the Quilters Hall of Fame in 2009 based on her expertise and extensive research on quilts and those who made them. Ms. Waldvogel will talk on the Fancy and Make-do quilts that East Tennessee is known for and will show an example of each on display in the museum gallery. Both types—Linsey (the Make-do quilt made of home-woven Civil War era textiles) and the 1853 White-work Wholecloth (the fancy quilt whose surface is stuffed with original designs)—reflect the lives of East Tennesseans at the time these quilts were created. Expect some interesting stories. 10:00 and 11:00 -- James Hooper has 42 years of experience in antique furniture restoration and custom building. He’s the furniture conservator for Ramsey House, Blount Mansion, and the Museum of East Tennessee History, as well as other historic sites in the Knoxville area. Walking amongst a secretary, pie safe, and chest of drawers on display, Mr. Hooper will give an overview of East Tennessee furniture and give hints to determine whether a piece has been altered or repaired. There will also be time for questions about care, cleaning, and moving of antique furniture. 10:30 and 11:30 -- Terry Faulkner is a long-time collector of East Tennessee baskets, furniture, and quilts as well as Knoxville memorabilia. She was a volunteer interpreter at Blount Mansion and Ramsey House and has documented the history of the Bearden community, publishing articles on the subject and designing and overseeing the installation of historic markers along greenways and sidewalks. She is presently co-authoring a book on the original Civil War Fort Sanders. Ms. Faulkner will share information on the distinctive, drawn-oak baskets made by the Hickey family. Working variously from several East Tennessee counties, Rufus Hickey made his living from basket making and crafting chairs and brooms, with the help of his children. 10:30 and 11:30 -- John Case is the owner, founder and president of Case Antiques, Inc. Auctions & Appraisals. He has over 25 years experience researching and evaluating American antiques and art, with a specialization in early Southern decorative arts. John is an accredited member of the Appraisers Association of America (AAA). He is a graduate of Duke University, the Uniform Standards of Professional Appraisal Practice (USPAP) course and exam, and a museum graduate course sponsored by the Museum of Early Southern Decorative Arts (MESDA) at Wake Forest University. John has given lectures on Southern material culture at MESDA and the William King Regional Arts Center, appraised for the television show Treasures In Your Attic, and served as a contributing editor for the Frist Museum’s 2006 Art of Tennessee exhibit in Nashville. In 2012 he was appointed to the board of the Tennessee Executive Residence Preservation Foundation. Mr. Case will discuss a chronology of events relating to the discovery of an important earthenware tradition in Greene Co. including Christopher Alexander Haun, J. A. Lowe, and other unknown skilled potters. 12:00 p.m. Bilo Nelson Auditorium -- Join Jess Stockton and Joe Scarpino as they delve into stories of interest surrounding Oak Ridge, including the Prophet of Oak Ridge, John Hendrix. The veteran social studies teachers launcehd their podcast in December 2017 and are currently on their 40th episode, all of which are available online via their website, iTunes, Spotify, SoundCloud, or Google Play. 1:00 p.m. Bilo Nelson Auditorium -- A fun and interactive show with Sean McCullough, host of "Kidstuff," WDVX's weekly children's radio show--guitar, banjo, and mandolin, drawing on the music of Appalachia. Grand prizes awarded for the BEST HISTORIC COSTUME and for the MOST EAST TENNESSEE SPIRIT! Emceed by Knoxville Councilman Marshall Stair with celebrity judges Dr. Dan Feller (UT history professor and director of the Papers of Andrew Jackson), Dr. Robert C. DeNovo Jr. (UT College of Veterinary Medicine), and Lori Tucker (WATE TV Personality). 10:00 a.m. - 5:00 p.m. Visit the Friends of the Knox County Public Library's book sale for various history-themed publications. Books for children and adults will be available for purchase. Show off your checkers skills by competing in a tournament of one of the world's oldest games. Prizes provided by Mast General Store! Children are invited to experience the past through games, crafts, and an old fashioned "cookie walk" sponsored by Cafe Vicolo. Among the crafts to enjoy are tricorn hats, Tennessee flag buttons, harmonicas, and more! Guests from the Muse and the Tennessee State Museum will be on hand with special hands-on activities. Join the Suffrage Coalition for the unveiling of the final touches on the Burn Memorial. An ice cream social will celebrate with remarks at 11:00 a.m. at the Memorial. Blount County Genealogical & Historical Society Mayme Carmichael School Organization, Inc.
Center for Oak Ridge Oral History Old Smoky Railway Museum, Inc.
Join the Tennessee State Parks for an afternoon of America's favorite pastime with a a World War I baseball game between the Army and Navy, played at Ridley-Helton Baseball Field, originally part of Bill Meyer Stadium, the former home of the Knoxville Smokies. The game will commemorate July 4, 1918, when America’s Independence Day was celebrated in Britain. Those festivities included a baseball game at Chelsea Football Ground between the U.S. Army and the U.S. Navy with the king and queen in attendance, along with 18,000 spectators. The game will begin at noon, is free and open to the public, and can be accessed by car or the History Fair buses. Join us for a cinematic celebration of the region's history! Presented by the Tennessee Archive of Moving Image and Sound and the Tennessee Theatre. TAMIS remembers broadcasting legend John Ward, beginning with a 1974 film capturing a busy day in the life of the “Voice of the Vols.” The 15-minute film follows Ward as he travels to Nashville to call a Tennessee football game, returns to Knoxville to call a Vols basketball game, records the weekly Bill Battle Show for television at the WATE studios, and conducts several radio interviews in between. We’ll also be showing an extremely rare short film made by local advertising firm Lavidge and Davis in the 1950s, featuring Ward giving a behind-the-scenes look at the firm’s studios. Rounding out the program will be vintage Vols footage, featuring clips from archival films of UT football games from the 1920s through the 1950s! The Dr. Walter Barth Collection of 16mm home movies feature some of the most unusual and interesting footage found at the TAMIS. Barth, a German native, began making 16mm home movies in 1927, capturing life in Germany and Europe before the rise of the Nazi regime. Barth emigrated to Binghampton, New York in the early 1930s, eventually moving to Knoxville. He continued filming into the 1960s, capturing fascinating footage of East Tennessee and the Smoky Mountains. In the early 1960s, students at Knoxville College organized protests of segregated restaurants and movie theaters in Knoxville, which had recently been designated an “All-America City” by the National Civic League. In the spring and summer of 1963, one of the focal points for marches was the Tennessee Theatre, and for several weeks the Knoxville Police Department filmed protests there. Alongside WBIR news film, newspaper articles and archival interviews with Knoxville civil rights pioneers Robert Booker and the late Avon Rollins, this recently discovered footage provides a new view of crucial events in Knoxville’s history. 2:30 p.m. - Happy Anniversary Tennessee Theatre! TAMIS digs into the vault to find footage of the Tennessee Theatre throughout the years. Included will be news coverage of the premiere of “All the Way Home,” based on James Agee’s novel “A Death In The Family,” and a circa 1970 look at the workings of the Mighty Wurlitzer Organ! Produced by Heartland Series’ Bill Landry and Doug Mills, “We Knew Her as Patsy” explores actress Patrica Neal’s unique relationship with Knoxville. Created as a tribute to Neal for the 2010 Knoxville High School Class of 1943B reunion, this is the first time the film will be screened for a general audience. Join us for a special screening of director Elia Kazan’s 1957 classic film, in a rarely seen 35mm archival film print! The debut film of Andy Griffith shows a different side of the actor than what most audiences remember from “The Andy Griffith Show” and “Matlock.” Griffith stars as Lonesome Rhodes, a singing drifter who finds national fame and political influence through his charismatic appearances on radio and television. Rhodes is aided by a producer played by Knoxville’s own Patricia Neal, who eventually comes to see the dark side of such power. (In a 2003 interview with the Knoxville News-Sentinel, Neal stated that this was the favorite of her films.) Selected for preservation in the National Film Registry by the Library of Congress as being “culturally, historically, or aesthetically significant,” the film’s reputation has continued to grow in the decades since its release. “A Face In The Crowd” film print preserved by the UCLA Film & Television Archive with funding provided by the Film Foundation and the Hollywood Foreign Press Association. Funding for this screening made possible by the Friends of the Knox County Public Library. Women's Basketball Hall of Fame: An internationally recognized museum dedicated to preserving the history of women's basketball. WWI Vintage Baseball Game: Experience America's favorite passtime while Army takes on Navy in WWI era uniforms at the historic field of the old Bill Meyer Stadium. Old Knoxville High: This important historic landmark has been meticulously renovated and restored to honor its role in shaping the city of Knoxville. Now serving as an independent senior living facility, the building boasts many original architecutral details, exhibits, and the Doughboy statue, erected shortly after World War I to recognize the 117th Infantry Division soldiers, including a number of Knoxville High graduates, who died in the war. Knoxville Walking Tours - "Misbehaving Women"
East Tennessee women have never been known for keeping quiet, and this stroll through history will introduce you to those who spoke out, whether about Women's Suffrage, education, employment rights, or equal treatment for the handicapped. Meet the Knoxville women who weren't afraid to be the voice of change. Jack Neely of the Knoxville History Project willl lead an unusual urban hike for the hardy. This year, the plan is to assemble at the History Center, walk across the historic Gay Street Bridge (the same one last seen by outlaw Kid Curry, when he rode the sheriff's stolen horse across it), and see some of the new preservationist development along Sevier Avenue, seeing why some people think it's close enough to be considered "downtown." Along the route will be the site of an 1880s horse and bicycle-racing track--which is, conveniently, now a public park. Visit Knoxville’s first church, founded in 1792, for graveyard and stained glass window tours. The Art Market Gallery on Gay Street will feature a memorial showing of works by Marjorie Horne, a long time, award-winning artist and member of The Art Market who passed away last year. Sales of Marjorie's paintings will benefit the Community School for the Arts. Visitors will also enjoy a reception with free refreshments. Visit the Market Square Farmers' Market for a smorgasbord of local produce, free-range meat, herbs, baked good, artisan crafts, flowers, and more! Visitors will enjoy Holy Smokin' BBQ, burgers and sliders from Forks on the Road Food Truck, sweet treats from the Phoenix Pharmacy and Fountain, kettlecorn and fresh squeezed lemonade from Dynamite Kettle Corn, and much more! There are many parking garages to choose from in Downtown and many offer FREE parking on the weekends. Check out the Downtown Parking guide to find your spot. Another great alternative is to use KAT, a worry-free way to get straight to the History Fair. Check out the KAT website or call 865-637-3000 to plan your trip. The last bus leaves Downtown at 11:15 p.m. so you can stay all day! Read our blog for Visit Knoxville on the East Tennessee History Fair! 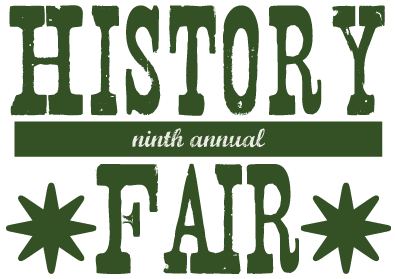 Click here to download the full 2018 East Tennessee History Fair Program.